These simple steps will help get your perennials off to a great start! 1. Make sure the garden area has been properly tilled and enriched, as good horticultural practice indicates. 2. 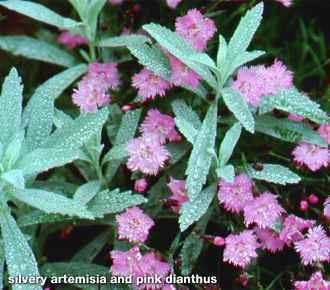 Plant on a cloudy day, or early or late in the day, to avoid the heat of the mid-day sun, which can stress plants. 3. Dig holes large enough to accommodate the entire root system or soil ball without crowding. A good guideline is make the hole 1.5 times the size of the pot your plant arrived in. 4. Carefully remove plants from the pots by tipping the pot on its side and gently easing the plant out of the container. Avoid damaging the plants by pulling them out of the pots by their leaves and stems. Watering makes it easier to release the plant from the pot. 5. Lightly feather out the roots to encourage ground away from the circular pattern of the pot. If your plant is particularly root-bound, you may need to make cuts in the root ball to allow roots to properly spread outward. Use a sharp corner of the plastic tag or a pocket knife to make four vertical cuts cuts top-to-bottom, one on each side of the root ball, and several cuts across the base; cut through the roots about ¼ deep. With your fingertips, lightly rough out the roots, side and bottom, so the soil ball has a fuzzy surface. 6. Set plants at their proper depth in the hole. Ensure that the crown (the area where the stem and root join) is at soil level. 7. Fill in the space around the roots with the backfill from the hole. Pat the soil down firmly, but not too tightly. 8. Form a small circular earth barrier several inches out from the plant. This will direct water to the roots. 9. Water in after planting to reduce stress and help drive out any air pockets. Add more soil as necessary. 10. Provide some type of shade if the weather is hot and sunny to reduce wilting and minimize transplant shock. 1. To prevent dehydration, plant bare root plants as soon as possible. 3. Prepare a hole as you would for a potted plant. 4. Spread the roots evenly and set the plant at the proper depth. The crown (the area where the stem and root join) should be even with the soil level. 5. Fill in around the plant using the backfill from the hole. Work soil between the roots as you firm the soil. Do not pack the soil too tightly. 6. Form a small circular earth barrier several inches out from the plant. This will direct water to the roots. 7. Water in after planting to reduce stress and help drive out any air pockets. Add more soil if necessary. 8. Provide some type of shade if the weather is hot and sunny to reduce wilting and minimize transplant shock. 9. Leave the appropriate amount of space between each plant. Although the plants are young and fairly small when you receive them, they will fill in quickly during the next 2-3 years. Plan your garden based on the plant's mature size. Check the product page or plant tag for the plant's mature size and plan your garden accordingly. 10. It is essential to mulch newly-planted perennials. Apply 2-3 inches of mulch for maximum benefit. Keep mulch a few inches away from the stem. 4. Remove all shipping material, if you haven't done so already. 5. Plant your perennial so its crown (the area where the stem and root join) is at soil level. 6. Fill around the roots with the soil from the hole. 7. Water the plant to settle the soil. Add more soil as necessary. 10. Mulch the soil around the plant to a depth of 2 inches. Keep the mulch away from the plant's stem. Add more mulch as your plant matures. 11. Leave the appropriate amount of space between each plant. Although the plants are young and fairly small when you receive them, they will fill in quickly during the next 2-3 years. Plan your garden based on the plant's mature size. Check the product page or plant tag for the plant's mature size and plan your garden accordingly. 12. It is essential to mulch your newly transplanted perennials. Blanket the top of the soil with 2 inches of organic compost or some other coarse non-packing organic matter such as rotted bark mulch or pine needles. This keeps the roots cool and the soil moist by shading the soil so the sun can't bake away the precious soil moisture. Take care to keep the mulch away from the plant's stem. Add mulch as needed as your plant matures, except in the case of certain xeric plants, such as cacti.